With over 14,000 islands and 65,000 miles of shoreline, professional guides, each with knowledge of the Lake of the Woods, are provided to assist your group in locating these award-winning treasures. 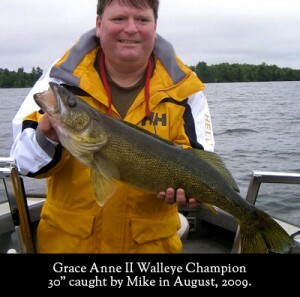 The lake also abounds with Walleye, Northern, Bass and Lake Trout. In order to reach the richest waters in the area, you and your guests will be met by our fishing guides in 20-foot pro-fishing boats, each equipped with 175 hp engines and all the equipment that you will need to catch an elusive Muskie. Each boat provides ample room for two guests and a guide (who will provide any assistance required), and has been outfitted with the most up-to-date Shimano fishing equipment and safety features. After a morning of successful catches, our guests are in store for the ultimate reward - the traditional shore lunch. The morning's catch is filleted then breaded in our famous secret recipe coating and fried over an open fire by your guides, whose outdoor cooking skills are as finely honed as their guiding skills on the lake. Click on a year below to see a video showcasing the massive muskelunges that have been caught by the guests of the Grace Anne II each season. 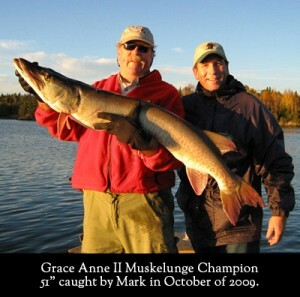 Lake of the Woods is one of the premier Muskie fishing lakes in the world. Let our expert guides take you on a fishing adventure second to none. We believe that the Muskies’ reputation of being “ the fish of 10,000 casts” began as a way of keeping other anglers from fishing for these monsters. Muskie (Esox Masquinongy) are trophy fish with all fish boated being safely released to fight again. With the minimum size on Lake of the Woods for a “keeper” Muskie being 54”, the population has greatly increased over the past decade as has the average size. Fish around the 50” length are becoming more common every year. The Muskie spawning period on Lake of the Woods is usually in early June. The season begins on the 3rd Saturday in June and runs until December 1st. Early and mid season Muskie fishing most commonly consists of casting lures of different colors and sizes and retrieving them towards the boat at various speeds. Hooks need to be extremely sharp and watching for “nicks” in the fishing line very important. You do not want to miss the fish of a lifetime because of faulty equipment. The favorite trick of the Muskie is to follow the anglers lure right to the side of the boat and swimming away when the angler pulls his lure out of the water. This is where the “Figure 8” of Muskie fishing comes into play. Before lifting the lure from the water, the angler must swing the lure through the water in a Figure 8 pattern when it gets close to the boat while watching behind the lure for a following fish. Many times when the lure changes direction during this important detail, a following fish will strike the lure. There are few fishing experiences that can rival the excitement of having a trophy Muskie, freshly hooked, fighting at the side of the boat! Once the Muskie is landed, a quick measurement and photo are taken and “Esox Masquinongy” is released back to waters of Lake of the Woods, unharmed but slightly more educated as to what she will have for her next meal! 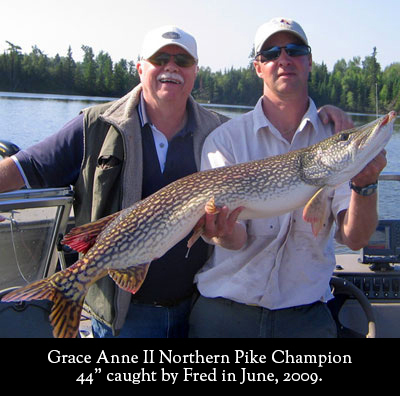 There have been many fish caught, and many large ones, by guests of the Grace Anne II. These are the all time largest fish that we've be able to capture on camera. Congratulations to these masters of the angling art and good luck to all others who hope to take their place. 2009 was an incredible year of fishing and we look forward to even bigger and better catches in the coming years. 49" caught by Colleen in August of 2009.